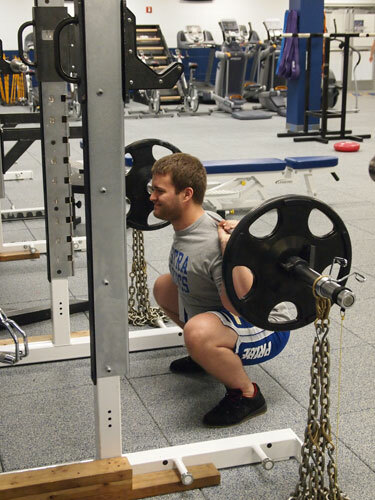 Hofstra University's 31-34 credit Master of Science in Sports Science (MSSS) (located in Long Island, New York) is designed to prepare students to work with athletes as strength and conditioning coaches in school and non-school settings. Students will develop the skills necessary to design and implement population-specific training programs that enhance athletic performance and reduce injury risk. The foundation of the course work is in the areas of biomechanics, exercise physiology, performance testing, periodization, program design, and sport nutrition. In addition, all students will have opportunities to complete various fieldwork experiences. The MSSS program has been officially recognized by the National Strength and Conditioning Association (NSCA) as a preparatory program for the field of strength and conditioning. The "ERP" logo is a trademark of the National Strength and Conditioning Association in the United States and/or other countries.